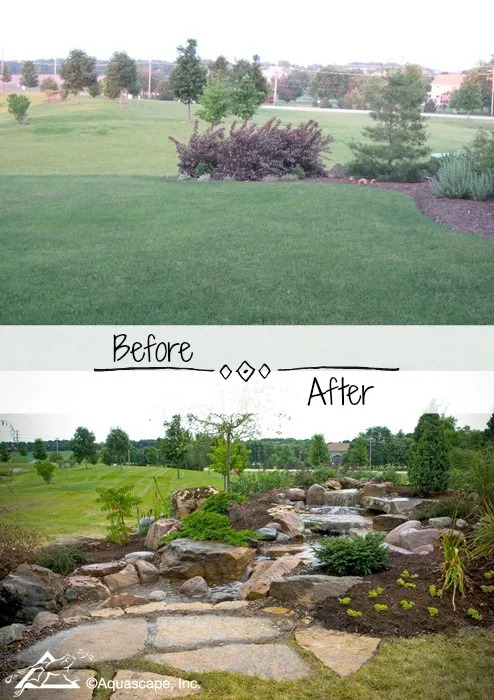 Backyard Transformations: Before and After - Aquascape, Inc.
Spring is just weeks away and you’re probably already dreaming of sprucing up the yard. Maybe you’ll add a new flower bed, or perhaps a vegetable garden is in your future. Or better yet, you might envision a glorious water feature so you can enjoy the soothing sights and sounds of running water. 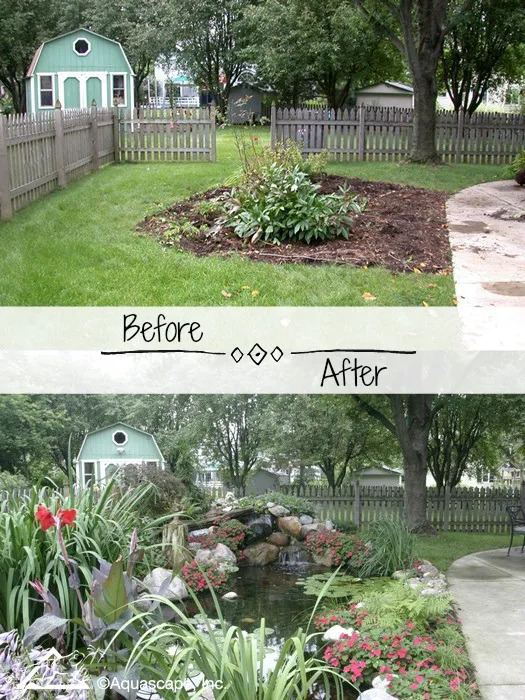 To help spur your creativity, we’re sharing a collection of beautiful backyard transformations! We might be a little biased, but we think any yard looks better with a water feature! 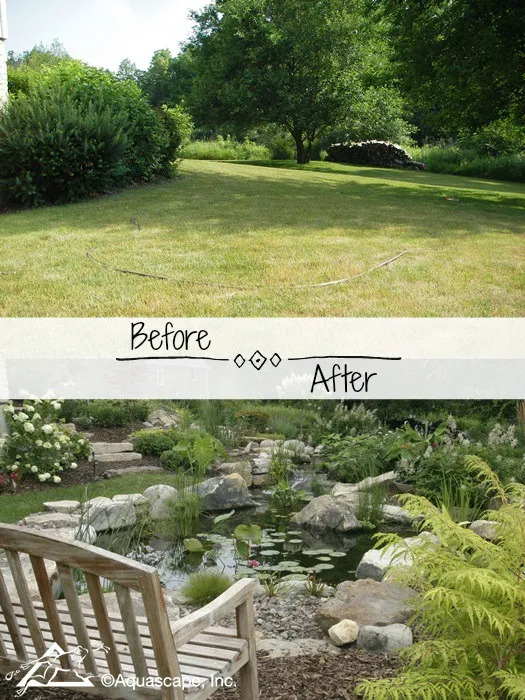 Imagine having to mow all this grass, and then think about how much better it could be relaxing on the bench admiring an ecosystem pond and waterfall instead! An unused corner of the yard near the backyard patio is simply wasted space. What’s more, there’s an endless battle of weed-pulling each summer. 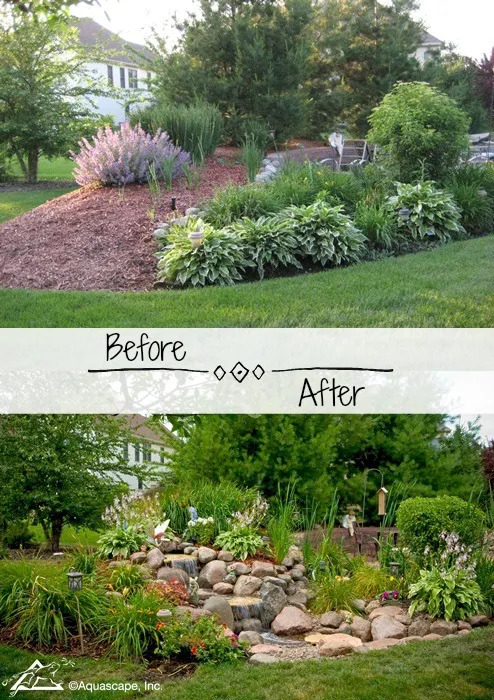 A new pond adds beauty and eliminates the problem of getting dirty fingernails from pulling weeds that crop up. When transforming your backyard with a pond or waterfall, it’s best to locate it near a patio or deck so you can enjoy it up-close. You’ll also be able to hear the running water from inside the house when you leave the windows open. 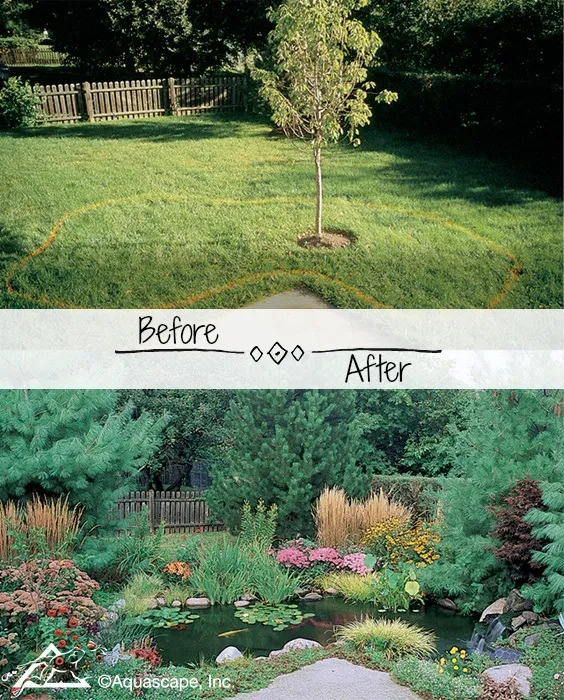 In the photo below, a small tree had to be transplanted – but the end result was worth it. 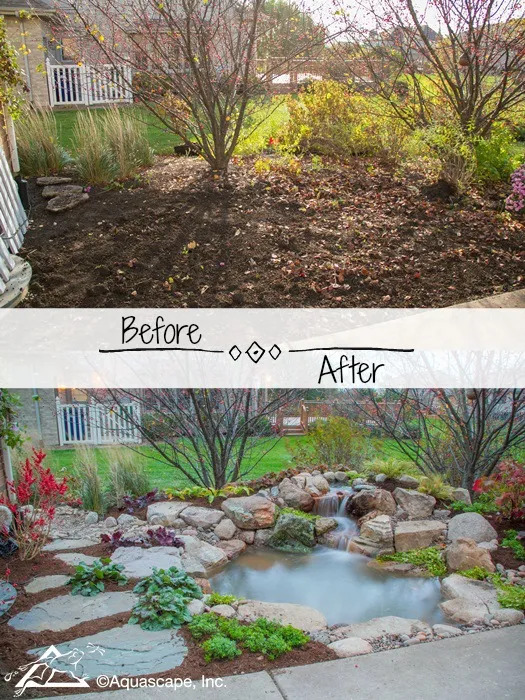 If you’re not interested in having pet fish, a Pondless® waterfall can also be used to transform space in a backyard. A berm lends itself perfectly to creating cascades of water. Even if you don’t have a berm, you can build one with the soil that’s excavated to carve out the waterfall. Waterfalls are great for blocking out unwanted sounds like nearby traffic, barking dogs, or noisy children. To be sure, a new flowerbed or vegetable garden is a wonderful addition to the yard. But neither of those create the soothing sound of water in the garden. Consider adding a water feature this year. Whether you choose a fountain, waterfall, or ecosystem pond – you’ll be glad you got your feet wet!